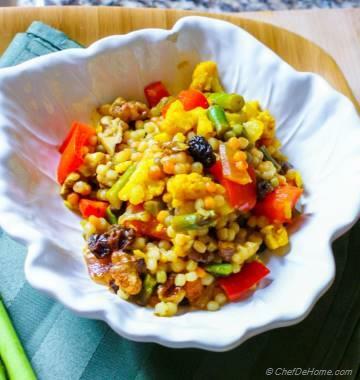 We are on eggless and meat-free diet these days and the most I miss is - egg wraps or egg sandwiches (especially in breakfast). Egg makes life so easy in morning, don’t you think? During this time, whenever I crave to have something eggy, I turn my attention to tofu. 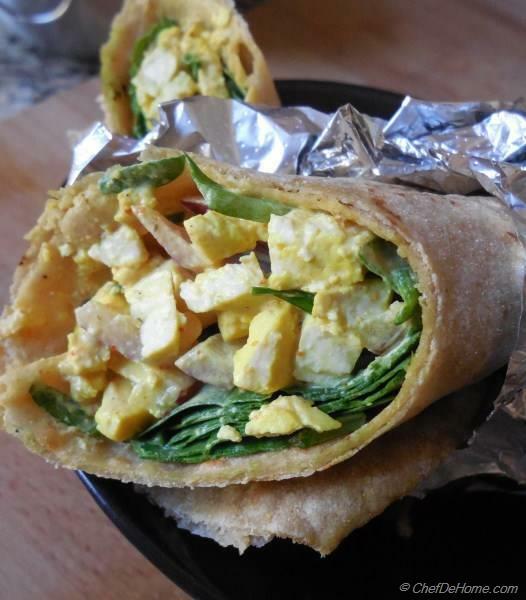 Yesterday, I made this Tofu Egg-less Egg Salad Wrap for breakfast and my husband (an egg lover and tofu hater) asked, “What is this? 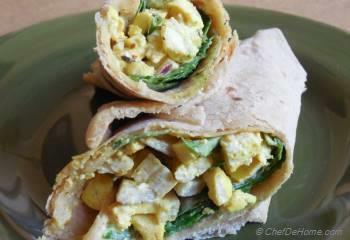 It is so tasty!” Yes, it is really very yummy and so perfect like a creamy egg salad wrap. 1. Dice tofu to very small size. 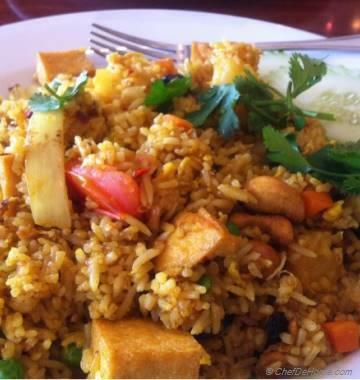 Fine dice tofu mimics scrambled eggs in taste, texture and look. 2. 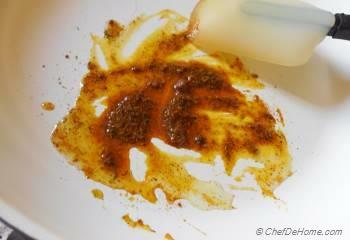 Heat 1 tbsp oil in a pan, when oil is hot, add curry powder and heat for 30 seconds. 3. 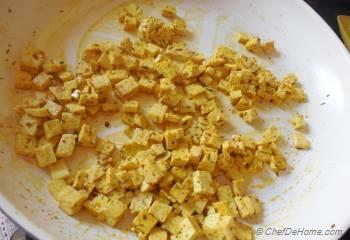 Add diced tofu and fry for 4-5 minutes. 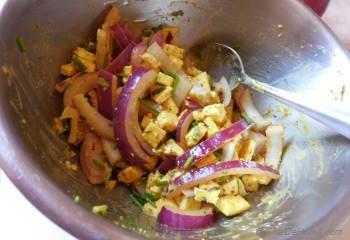 While tofu is cooking, in bowl, add sliced onion, vinegar, mustard, chives, salt and pepper to taste and set aside. 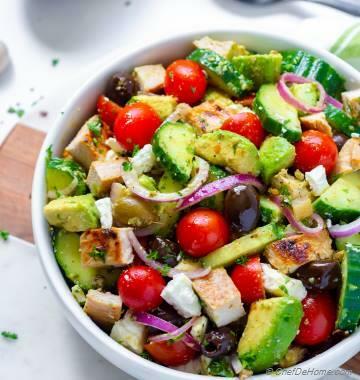 Looking to prep tofu for salads? 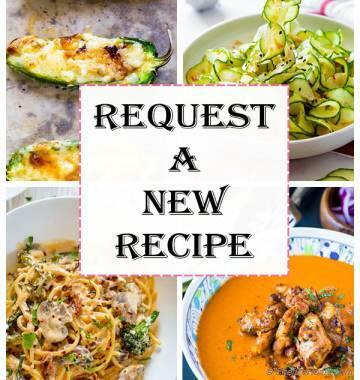 - Microwave tofu for 1-2 minutes or saute tofu for 4-5 minutes improves tofu texture and makes it firm and not mushy, perfect for salads. 4. 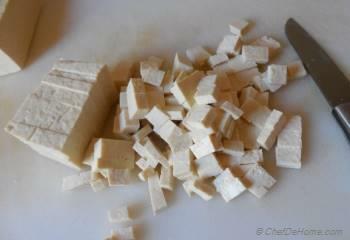 Once tofu has cooled a bit, mix it in onion and vinegar mixture and vegenaise and toss to combine. 5. Warm tortillas, layer tofu salad, spinach and wrap. 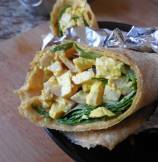 Slice and enjoy a yummy vegan egg wrap. If I am out of "Vegenaise", I often use sour cream for this wrap. Just remember to mix in sour cream just before serving. 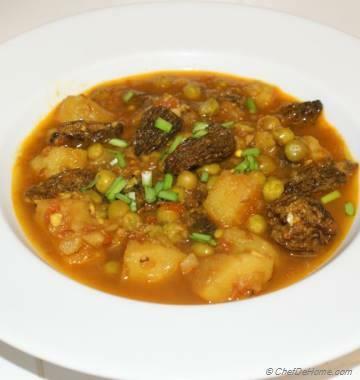 Like, you can make tofu and mix it in onion mixture at night. Mix in sour cream in the morning just before making wrap. Please note - Sour Cream will not be an option for vegans.